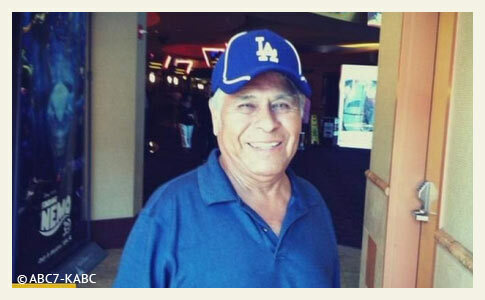 Valentine Herrera, 76, did not survive his injuries from the violent pit bull attack. 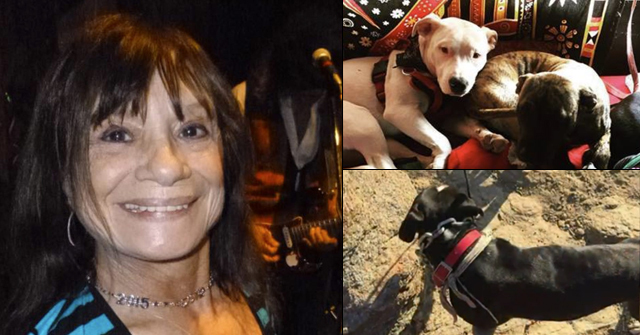 Los Angeles, CA - A 76-year old man critically injured by two pit bulls in early February has died, according to family members. 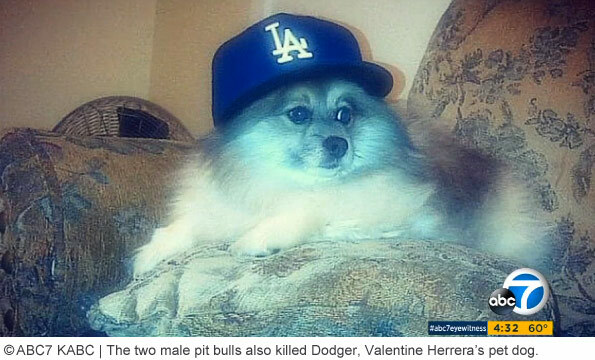 Valentine Herrera and his small dog were savagely attacked by the pit bulls on February 2 while walking in Lincoln Heights. The attack occurred about 6:00 pm on the 2600 block of North Lincoln Park Avenue. His pomeranian, named Dodger, was killed in the attack. Herrera was rushed to the hospital and underwent brain surgery, family members said. At the time of the vicious attack, Herrera was suffering health difficulties, including a heart condition and being on dialysis. In November, he nearly died of a heart attack. After the mauling, his son, Luis Herrera, said his father briefly died during the heart attack. "I lost him for 32 minutes -- he died for 32 minutes -- and then came back," Luis said. "He was living way better than before, and now this happened." Herrera's family must now go through this terrible pain all over again. The pair of male pit bulls first attacked Dodger, shredding the small dog to pieces. When Herrera intervened, the pit bulls knocked him down and began tearing into his flesh. Neighbor Frank Carrasco witnessed the vicious attack. "I saw these two pit bulls pulling something apart. I thought it was a piece of material," he said. Carrasco said the owner of the pit bulls offered no apology to the victim nor did he attempt to help the elderly man sprawled on the ground and bleeding. The same two pit bulls had killed another neighborhood dog just 4-days before attacking Herrera. 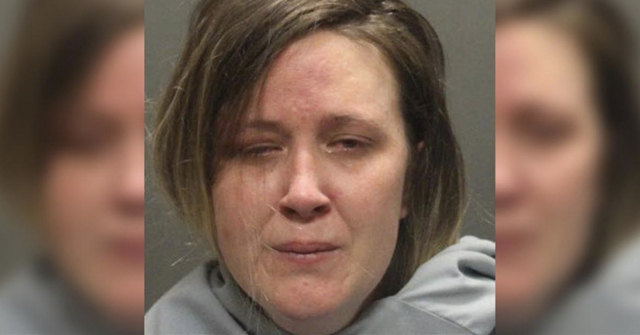 Stephanie Grezelle said the pit bulls killed her dog, named Tulula right in front of her two young children, reports CBS Los Angeles. "They watched their dog get mauled in a puddle of blood,” Grizelle said. "We rushed her to the hospital. We tried to save her. Later that evening, she stopped breathing. There was too much damage, and she died." She said Tulula never stood a chance. A dangerous dog hearing was held Wednesday. CBS Los Angeles reports the outcome could lead to criminal charges against the owners of the pit bulls. Herrera's family members and witnesses testified at the hearing, reliving the horrific attack. 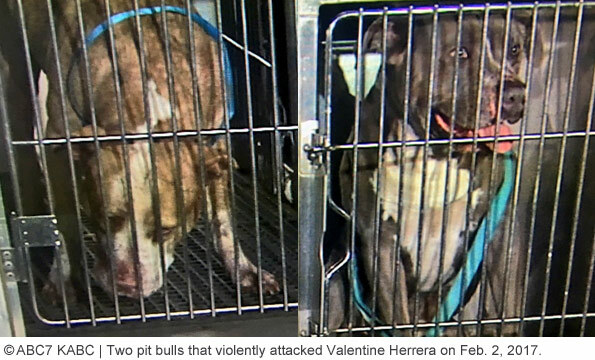 The pit bulls' owners testified as well, defending themselves after their dogs brutally attacked a man and killed at least two pet dogs in less than a 1-week period. Los Angeles Animal Services is expected to issue a final decision within 30 days. What appears to be the primary issue about the potential criminal charges of this case is how the dogs escaped the owners' property. We've highlighted portions of the California felony dog attack statute, which may be at play (§ 399. Mischievous animal causing death or serious bodily injury; negligence of owner or person having custody or control; punishment). The highlights indicate the elements that must be proven beyond a reasonable doubt in order to obtain a felony conviction. "(a) If any person owning or having custody or control of a mischievous animal, knowing its propensities, willfully suffers it to go at large, or keeps it without ordinary care, and the animal, while so at large, or while not kept with ordinary care, kills any human being..." -- Knowledge of propensities and failing to keep the dogs without ordinary care. The pit bull owner's actions after the attack may be a factor too. Witnesses said the owner did not attempt to help Herrera at all. View the DogsBite.org Google State Map: California Fatal Pit Bull Attacks. This is a wrongful death case if there ever was one. Time for some BSL: Breed-specific litigation. These dogs should have been taken after the FIRST attack!!! That the owner would not only keep them but ALLOW them to maul a second time and stand there and do NOTHING says everything about the mentality of pit owners in general. Exactly the reason dogs who attack dogs need to be put down too! They go on to kill people as well. But that's killing dogs! And that must never happen! The Cult of Dog will not allow such a thing. Oh, dear. That poor man and his poor family! May God bring them comfort. Catherine Hobbs, you are so right. Yet again we see that the line pit advocates spout about animal aggression being different from human aggression isn't true. Yes, there are some dogs like terriers that may kill rats and would never harm a human (though some are known to bite people)…but a dog bred originally to take down bulls and bears doesn't think twice about seriously going after a person. HOW is this not a national issue?! Im honestly just baffled by all the attention on bans over immigrants & guns & GMO etc etc but *this* is the issue i see killing innocent children & terrorizing communities on a weekly basis ALL over America! Im just baffled by its total absence in Natl Gov discussions on safety, how many people have to die? The horrible mauling deaths of so many innocent animals is by far enough in my mind to establish a crisis, but leadership silence on mauled citizens & murdered children just takes it to a whole new level of unbelievable denial. Really, what will it take to bring this to the national stage?! If it's to become a national issue, then we are going to need to discuss the out of control worship of dogs. That's the root of this problem. I will never understand this, ever. I know so many people who own these pits and all say how wonderful they are. If I direct them to this site they get so defensive and call me ignorant. Talk about denial! Shelters are overrun with this type of dog. Now some cities are regulating adoption so you can only adopt a shelter dog! This is getting dangerous for everyone! The correct euphemism is "homeless pet." "Shelter dog" is so last year. How can they even pretend they have NO knowledge of the dogs vicious propensity OR ability to escape when they escaped and killed just FOUR days earlier? These people should be in jail for negligent homicide! I don't think all dogs that attack other dogs will necessarily become aggressive to people. Aggression isn't a black and white issue – there are different reasons a dog will become aggressive. Fear aggression – a dog that is terrified of other dogs may attack to defend itself when approached by a dog – if those dogs are not afraid of people then they wouldn't become aggressive to people. Fear can be very specific – some dogs are scared of people wearing hats for example or specific breeds of dog. Dogs that view other dogs as prey might attack a person if they also view people as prey (more likely to attack a child as children run around and shriek and can trigger prey drive). A dog that is territorial could attack any animal (including humans) that encroached on its territory but is unlikely to attack outside of its perceived territory. Pit bulls attack dogs because they have been bred to view dogs as prey – it's clear that it is normally prey drive in action when they attack as they don't usually bark or growl or give any warning other than a fixed stare (like eye in border collies – the beginning of the hunting sequence). 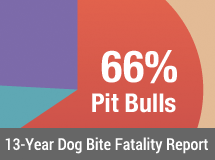 Pits weren't intended to attack people but as we know man biters weren't actually culled so there are some lines that would routinely attack humans too (Colby's own dog killed his nephew and it's unclear if he culled that dog or continued to fight and breed from it). Many of the man biters were grand champion fighters and were extensively bred from so are more common than pit advocates would have you believe (particularly in the game bred dogs). I do think that a dog that mauls or kills another dog should be put down – because even if it's only fear aggression if it has escalated to that point (the first attacks would have been nips or minor bites unless the dog never had any bite inhibition at all) it's very difficult or impossible to rehabilitate and you can never trust that dog again. i think laws need to be established that if you want to own a potentially dangerous dog that weighs over 50 pounds, you'll need a class II license, that the animal will be under supervision when not at home and muzzled at all times while been walked on a leash. Plus, owner would also have to have liability insurance. Was the owner of these pits ever identified? 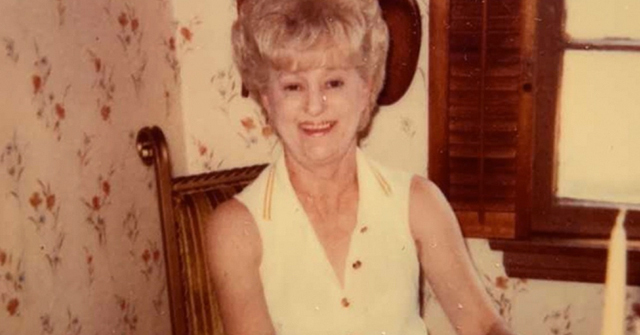 "The widow of a 76-year-old man, who died three weeks after being attacked by two pit bulls in Lincoln Heights while walking his Pomeranian nearly a year ago, is suing the animal’s owners. Anita Herrera Enriquez’s wrongful death suit names Abelardo Zavala, Abelardo Zavala Jr. and Leticia Zavala as defendants. The suit, filed Tuesday in Los Angeles Superior Court, seeks unspecified damages."